POXIMIX® PARA INTERIORES is a white-colored gypsum made product, ideal for repairing cracks and gaps on indoor walls and ceilings. 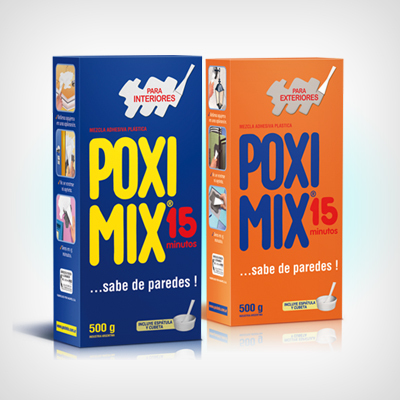 POXIMIX® PARA EXTERIOIRES is a cement-made product ideal for repairing cracks and gaps on outdoor walls and roofs. It is specially recommended for setting and fixing activities, and shows excellent weather-resistance. 500 g cases, including a putty knife and bowl to mix product 1250 g and 5kg bags.